A white cat was raised in a Wang’s family in Xinjiang, mainland China. One day, the pregnant white cat did not return the whole night until the next noon. It brought back with her a little weasel! 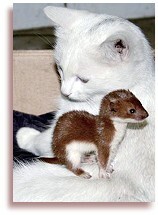 What was most surprising was that the white cat treated the weasel as if it were her own kitten. Every time the weasel crawled under the cat’s belly, the mother cat always held it in its legs. The “mother” and “son” were very close to each other. Two days later, the white cat gave birth to five kittens and became a real mother cat. 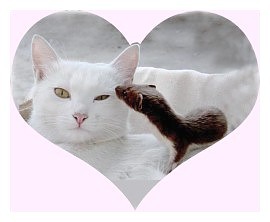 The affection between the mom cat and the weasel remained the same. Every day the white cat licked gently the weasel, and the little weasel got along very well with the kittens. They all enjoyed playing on the cat mom’s body. The weasel is normally a very ferocious and carnivorous animal. But this weasel eats only cucumbers, watermelon and buns. Particularly, it likes cucumbers the best. A similarly heartwarming story also happened in Hsinchu, Formosa. One man found two abandoned homeless kittens. Worrying that they might die of hunger on the street, he kindly adopted them. In the beginning, the kittens were fed with powdered milk. But kittens that have just opened their eyes do not drink milk by their own initiative. A good idea came to the adopter, that a mother dog from a recent delivery could be their nursing mom. Unexpectedly, not only did the mother dog he found not show any hostility to the kittens, it also acted as a good mother. The two kittens suckled vigorously at the mother dog’s breast and were not willing to leave for even one second. 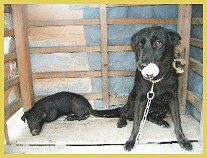 This compassionate mother dog was originally also homeless and was later adopted by the kind person. She recently gave birth to a litter of puppies. There is black female dog named Xiaowei that was raised for more than five years in a Lee’s family in Yilan county of Formosa. Mr. Lee built a dog house in the open space in front of the door. Surprisingly, a few days ago a wild boar was found in the dog house. When hungry, this young wild boar went to suckle at Xiaowei’s breasts. But the female dog was not producing milk and so the little boar kept on wailing. Seeing this, immediately Xiaowei touched the little boar’s head gently with her mouth as if to comfort it. At night, Xiaowei took care of the little boar so it could sleep inside the dog house, and then she guarded outside and waited till the little boar fell asleep before entering her house. The more interesting thing was that wherever Xiaowei went, the little boar always followed behind. Sometimes the little boar could not follow the dog’s steps and wailed for help. Then the dog would stop, turn her head back and wait for the little boar. The nearby citizens could not help smiling at this warm and interesting scene.